Moving to Nashville means you’ll be an easy drive away from other popular Smoky Mountain destinations, including Gatlinburg, TN. Gatlinburg is a weekend getaway for Nashville locals that don’t mind the 4-hour drive. Once you get to Gatlinburg, you can relax into the slow, small-town pace. Kick back and enjoy the spectacular views of green mountainsides framed by smokey blue skies. 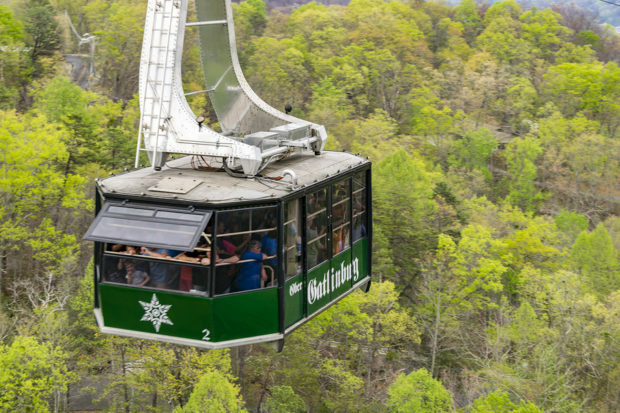 Here are a few other Gatlinburg attractions you may want to see during your stay. Gatlinburg is on the map because it’s the gateway to the Great Smoky Mountains National Park – the most visited park in the U.S. Visiting the park is something every Tennessee resident has to do at least once in their life. The park’s 522,427 acres actually straddles Tennessee and North Carolina. There’s so much to explore campers could spend months hiking the 850 miles of trails. In total, the mammoth park attracts over 11 million visitors a year. That’s more than double the number of people who visit the Grand Canyon. During the fall and winter, Ober Gatlinburg is the place to be. It’s part amusement park and part ski resort. Every October you can also celebrate German heritage with a hefeweizen at Oktoberfest. The festivities help boost the number of visitors at the Great Smoky Mountains National Park to over 1 million in October. There’s also a cable car you can ride up and down the mountainside. It offers a bird’s eye view of the mountain chain that you can’t get anywhere else. You can get one of the best views in the Smokies at the Gatlinburg Space Needle observation tower. The structure rises 407 feet in the air and has an outdoor deck that wraps all the way around the top. You can get great shots of the entire city nestled in the valley of the Great Smokies. There are also a number of exhibits at the top of the needle. It’s a great precursor if you plan to visit Great Smoky Mountains National Park. Once you’re done learning about the area you can play the night away at the two-story arcade below. Kids and adults equally enjoy spending hours playing 150+ games and gathering tickets at Arcadia. Gatlinburg may be miles from the ocean, but you can explore the depths below the surface at Ripley’s Aquarium of the Smokies. It’s been voted the best aquarium in the U.S. for good reason. It’s pure underwater fun complete with a shark lagoon and coral reef. What’s most impressive is all the interactive, hands-on exhibits. You can touch a jellyfish, waddle with penguins and swim alongside stingrays. There are also overnight packages that give families the chance to sleepover with sharks and see the aquarium after dark.